The Village Hall has a large ‘Main Hall’ and nearby kitchen and toilet block, as well as a smaller room, with its own entrance and lobby, often referred to as ‘the Committee Room’. The Main Hall is double glazed throughout with a double patio door opening onto decking and a small lawn overlooking the cricket/rugby field. 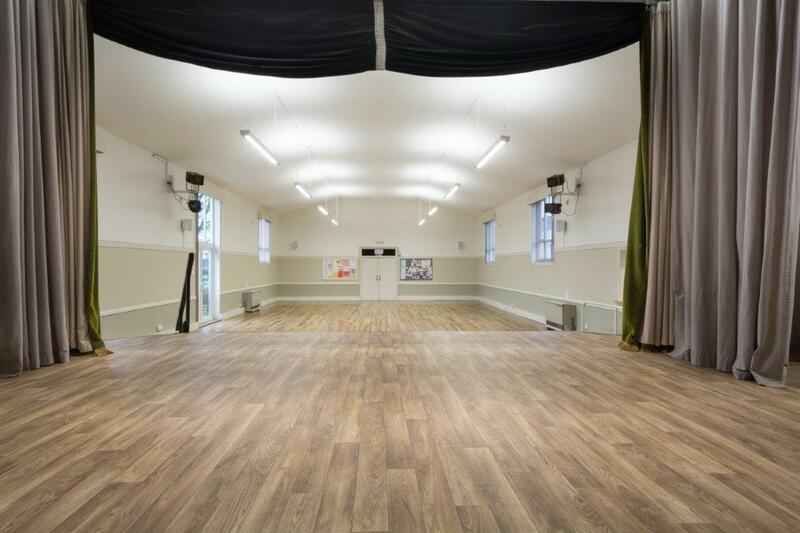 One of the features of the Hall is a beautiful African hardwood floor which makes it ideal for parties and functions. There is a serving hatch to the small but functional kitchen with cooker, refrigerator, self-filling water urn, fan, wall heater, etc. There is sufficient crockery and cutlery for 80. The Main Hall is 16m x 10m, has a large, curtained stage, seats around 100 and is licensed for up to 200. It has pre-programmable heating, contains a speaker system and hearing loop, available on request, and is likely to have a large, free-standing projector screen for use in the near future. Ample chairs and various tables are available. Ladies’ and Gents’ toilets are situated at the far end of the Hall, along with accessible facilities for people with disabilities and baby-changing facilities. There is also a unisex toilet off the entrance lobby by the kitchen. The Committee Room is 8m x 10m, seats around 24 comfortably, and is available and suitable for small meetings or gatherings. While it can potentially be used as an additional area when the Main Hall is hired, this part of the building can be used independently as it has its own door to the car park, a portable ramp to aid access, tables, chairs, heating which can be pre-timed, and a separate, unisex toilet. By summer 2017, it is expected also to have a small kitchen equipped with a kettle, crockery etc. The Village Hall is situated within its own large Car Park.